This blog is cross-posted on my personal website’s blog. This week’s blog will focus on one of the things the Wainwright Lab does best, fish suction feeding. One of the current projects in the lab is comparing the kinematics of suction feeding from a large inter-specific group of fish. To do this, we film fish feeding on various prey (mostly zebrafish) with a high-speed video camera at a 1000 frames per second. Once the sequence has been captured the videos are digitized to obtain several kinematic parameters associated with suction feeding, such as gape and jaw protrusion. A product of this research is some amazing videos of a diversity of fish using suction to subdue prey. Throughout this blog I will post some examples of the fish we have filmed. Hopefully these videos will allow you to observe not only the diversity in fish species, but also the diversity in the kinematics associated with suction feeding. The first video comes from a fish that made its debut at UC Davis’ 97th annual Picnic Day this last Saturday. The Wainwright lab had a small demonstration for the public, showing some videos of the various fish in the lab. Also present were two charismatic frogfish on display for the public. The public got to see the live fish and their feeding kinematics in slow motion from some videos. One of the fish on display was the sargassum frogfish (Histrio histrio) of the family Antennariidae. One of the unique features of Antennariidae is that the first dorsal fin ray is modified into a lure to attract prey. These fish tend to be sit-and-wait predators so the lure helps bring in food. The sargassum frogfish can be found in most tropical seas living among the Sargassum weeds, hence its name; often near reefs. It is the only frogfish with a swim bladder, allowing it to float among the weeds. They can reach a size of 20 cm total length (from the most anterior tip to the edge of the caudal fin); and their color patterning is a mottled greenish/brown with numerous weedy dermal appendages. This patterning allows the sargassum frogfish to blend in to the weeds waiting for unsuspecting fish or shrimp. Unlike some of the other frogfish, this species swims more in open water, and some divers have noted their ability to jump out onto the floating weeds to avoid potential threats. In terms of their feeding, these fish are mainly sit-and-wait predators, hiding among the weeds; however they do have the ability to swim after prey. The lure in this species is small compared to some other frogfish. Once the prey is close enough, the frogfish initiates its strike using suction to obtain the prey. Being a sit-and-wait predator these frogfish have little to no body displacement (you can see it is not swimming to capture the prey item in the video below), but you may also notice their mouth can displace a good distance in order to capture the prey. This clip is a mid-water strike, typical of this species. These strikes are also extremely quick. This video was filmed at 1000 frames per second, but is playing back at 10 frames per second; so the actual strike is much faster than the video playback. One of the things we are interested in is the variation in kinematics of suction feeding associated with different ecologies. Have sit-and-wait predators evolved a greater mouth displacement compared to more active foragers? 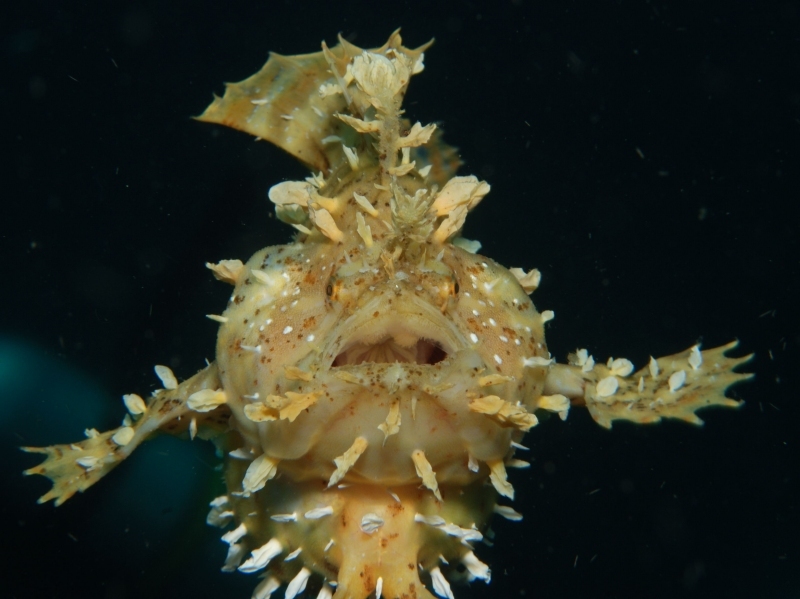 The data we are collecting will be able to shed light on some of these questions, and the sargassum frogfish is a good example of a sit-and-wait predation strategy.